Since 1954, Delta Zeta Sorority has shared a partnership with Gallaudet University in Washington, D.C., the world's only university with undergraduate programs accessible to hearing-impaired students. Delta Zeta endowed the Delta Zeta Scholarship Fund and the Fine Arts Endowment Fund. In 1995, the Delta Zeta Dance Studio was dedicated. Donations to the Delta Zeta Foundation that are designated for Gallaudet University are used to fund Gallaudet Scholarships or other funding needs for the University, including endowment support for the library and performing arts. Gallaudet University manages the funds donated, selects the scholarship recipients from the University, and administers the disbursement of scholarship funds. 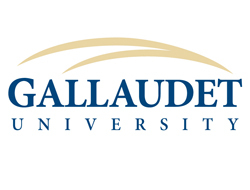 To learn more about Gallaudet University, visit them at http://www.gallaudet.edu/.